Lapland is not for backpackers as its extremely expensive place in terms of activities and Stay. Its surely an expensive trip. Also, covering everything is not ideal, so list down your priorities and reserve others for next winter destination. Best way to prioritise is to select stuffs exclusive to Lapland and leave other usual stuff like skiing, ice fishing etc. Below itinerary is based on not to miss activities. So as promised earlier a good plan will save on hopping and let you experience the most of unique Lapland. Two good cities to choose is Rovaniemi and Saariselkä based on attractions and connectivity. One need to reach any of this city in the morning hours to catch up with the activities. Below plan is based on Helsinki-Rovaniemi-Saariselkä-Ivalo considering reaching Rovaniemi as first day. After reaching Rovaniemi in morning, experience Santa Claus village. Make sure you stay in city for good connectivity. Take bus no. 8 to Santa Claus village and spend whole day here. You can cover below in this one day. Meeting Santa Claus , reindeer sleigh , souvenirs shopping, cross Arctic Circle, click amazing photos, post letter to Santa, ice-sculptures , ice bar and enjoy the beautiful Santa Claus village. 1. Start with clicking photo with Santa, this may have queue. They sell the photos/videos just outside his room for 30-40 euro and its worth spending for a memory. Santa stays in Santa Claus Office which is right behind the big Snowman. Refer current opening hours. Santa is generally available 10 am to 5 pm with 2 breaks of half an hour around 12.30 & 15 hours. They also offer Certificate of meeting/being nice to Santa. 2. Cross the Arctic circle line and click photos, its in the entrance of Santa Claus village. If you like to get certified for crossing Arctic circle, you can buy it from their office. 4. Reindeer sleigh ride – Right behind Santa office is the reindeer sleigh with very reasonable price as compared to other reindeer sleigh safari. Buy ticket on spot but for 3KM ride its better to e-mail them before hand. a. Napatapuli – It is fast food restaurant, good to grab a burgers and beverages. b. Ensilumi – This is at the lounge area of snowman world. Refer Restaurant and Cafeteria for menu. Note : No need to buy tickets for snowman world to dine here. 6. Shopping – Best place to pick souveniers. Huge variety. Prices of souvenirs are pretty standard all over Lapland but here you will get good variety. 7. Santa park is open only for 40-45 days in an year during winter. Refer link for opening timing. 8. Send Santa Claus letter to your loved ones – You can order a Santa Claus Letter to be sent to you or any friend in main post office, which will be sent by Santa Claus before Christmas. This is full day excursion. Icebreaker cruise safari covers ice-water floating/swimming and witnessing Sami village near a river separating Finland & Sweden with good Lappish lunch. Booking with pickup and drop is advisable as this is at the border of Finland and Sweden. So just book and relax they take care of everything. It comes around 335 euro with transfers from Rovaniemi. They are really good. They make sure to make it a cherished moment of your life. After reaching the middle of frozen sea, they arrange for few activities like snow sledge , good music, warm berry juice and also snow mobile. You need to pay extra only for snow mobile in case you want to ride and rest of the activities is included in the package. Optional – Go for Aurora(Northern light) hunting at night. After coming back to Rovaniemi, if you still want the thrill to be going then opt for northern light hunting. Leave from Rovaniemi to Kakslauttanen early morning in a bus. It generally reaches around 11 a.m. Keep the luggage in reception/luggage room and explore the resort for an hour or so. Have lunch & check-in to Glass igloo around 2-3 pm. Enjoy your breakfast in Kakslauttanen then either shift to their log-chalet or move to next hotel in Saariselkä town to catch up with the activites. Go for 2 hours of snowmobile safari. 2-3 hours is a good duration to explore the Lapland pine tree forest and touch the top most peak of Saariselka. This will be little hectic so its time to relax with Finnish smoke sauna. It is a sin to go Finland and not experiencing Sauna. Take a dip in ice cold fresh water after getting warmed up in smoke sauna. For northern light hunting their is an option of bus Or snowmobile. Opt for snowmobile if you have driven it previously and you are comfortable with it. It might be dangerous at night for 1st timers. For Santa Claus Village, Few safari company also provide the package but its costly. If you do it on your own it will cost you half the price. If you want to start your trip from Kakslauttanen i.e. 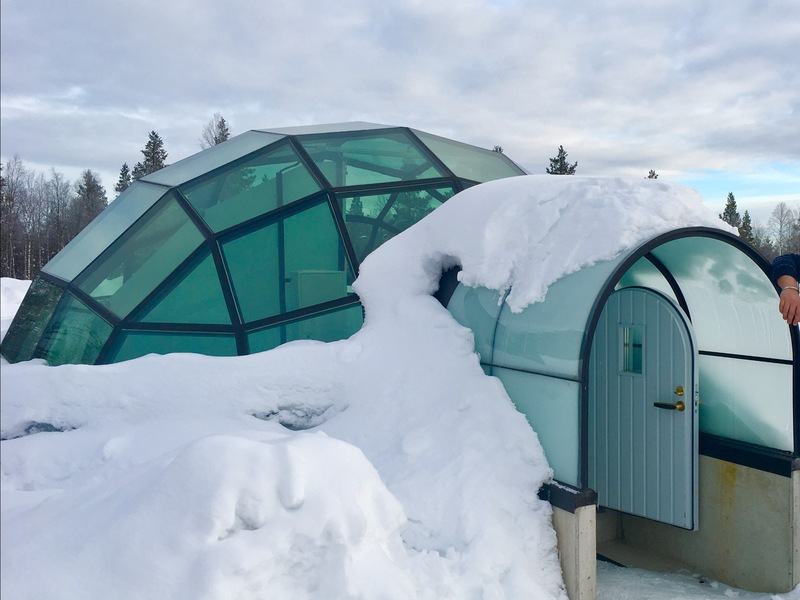 Helsinki-Ivalo-Saariselkä-Rovaniemi, then follow the above itinerary in order – Day4 , Day 5, Day 1, Day 2, Day 3 as you will be reaching Kakslauttanen in afternoon and their check-in time is around 3 p.m., so you are not loosing anything.